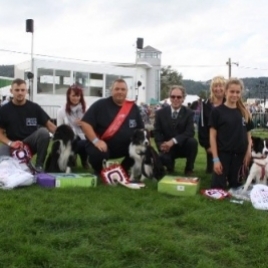 The finals this year were once again held at Malvern Three Counties Autumn festival. This show works so well for us, and we are very grateful for their ongoing commitment to these events. The Camddwr Cup has been running now for several years, and as the names of handlers and dogs now grows on the silver perpetual cup, so does the quality of finalists for these events. I think this worked extremely well and I am sure the handlers agreed that it definitely made for a new and exciting addition to the finals as 7 Medium dogs were invited to compete alongside the large dogs in both the warm up and final events. We are so lucky to be blessed with such great weather again this year, and the Malvern hills make the best backdrop for this beautiful venue. Once again, the standard did not disappoint, and some great partnerships did their best to secure their grip on that silver cup! So over to our Judge for the day- Dave Deaville- who did such a brilliant job at judging the finals for the day. 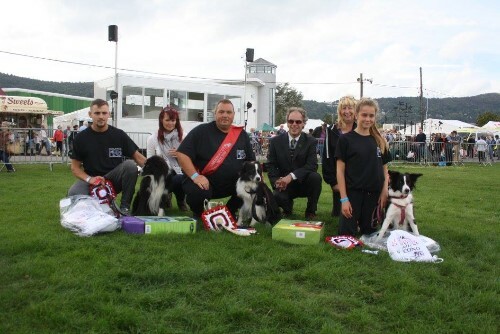 It was an honour to be invited to judge this year’s Camddwr Cup and Agility Secrets Finals at the Malvern Autumn show. The morning invitation jumping event was for all the finalists. The course was flowing with a couple of places that tested the dog & handlers partnership, especially the weave entry. The leading times were very close with Lynette Chant & Pannursed Push the Button edging ahead to win out of the 10 clear rounds. Full results of the morning invitation below. A steady breeze dictated a couple of last minute co urse changes before the Camddwr Cup final commenced. Again a flowing course but with just enough work to test the handlers. There were a few missed contacts with handlers pushing for a quick time. This turned out to be the closest of all three events with the top three being separated by less than ¼ second. There were 6 clears in all. An honourable mention to both Sara Bacon and Jack Greenwood who came so close but they were pipped by a lovely controlled round by Barrie James and Mendipstar Rumour Has It who proved to be a popular and deserved winner. Full results for the Camddwr Cup final below. Many thanks to all my ring party for an excellent job. Also thanks again to Camddwr Canine Ltd , Agility Secrets and RAS Rosettes for running these great events for our sport.